What's New from Nancy Moore Bess? 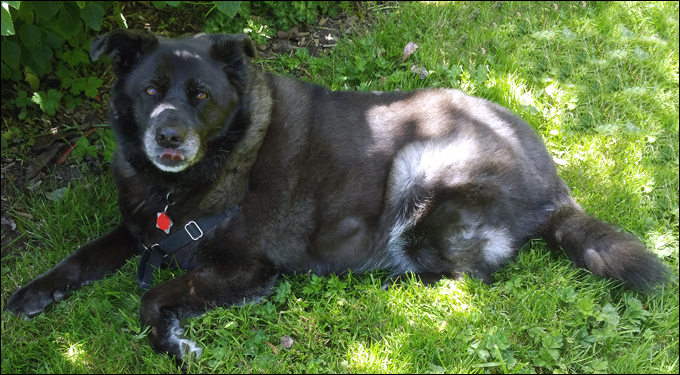 Honest and Loyal, dogs are the truest friends and most reliable partners. My dog, Momo, is the love of my life. How appropriate that Wes Anderson opened his latest film, Isle of Dogs, in the Year of the Dog. This twined piece, in my favorite red, is now at browngrotta in Wilton, Ct. It was inspired by how tinkers used to repair ceramic and metal vessels. There is a little boro inspiration as well. My Pasadena studio is up and running. Tom and Rhonda at browngrotta invited me to submit a piece for consideration in the upcoming 2019 exhibition, Identity + Intersection. I am very excited about the topic and may concentrate on how Japan has influenced my work beyond form. In December Japanese shops and newsstands begin selling products with images of the forthcoming zodiac sign for the New Year. Over the years, I have collected many postcards and magazine covers. Roosters and rabbits were always my favorite images. Each calendar year is associated with an animal sign and one of five elements. 2017 is a Fire Rooster year. Born in a Rooster year, you are hardworking, courageous and confident. You love being around people and being the center of attention! These could be interesting people to be around. January was a grey month here in terms of weather, but not in terms of work. 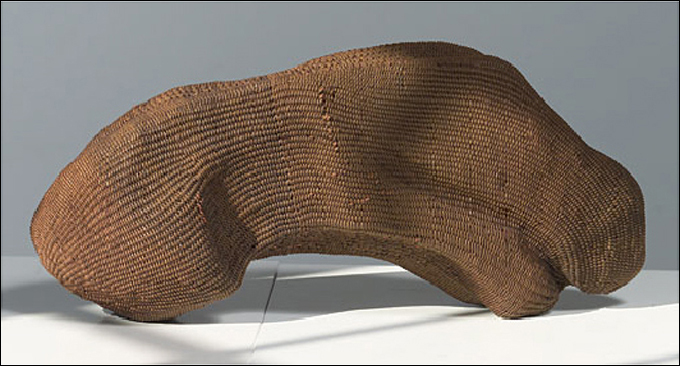 The exhibition, "Rooted, Revived, Reinvented: Basketry in America," is now traveling until 2020, and began its schedule, appropriately enough, at the University of Missouri. I was so excited to see that Selvedge magazine, that exquisite London publication, included my work in their March issue. The article, Flexing the Traditional: Contemporary Basketmakers foster form and fluidity, was illustrated with four photographs by Tom Grotta. My piece, At Water's Edge, is a favorite of mine because of its history. 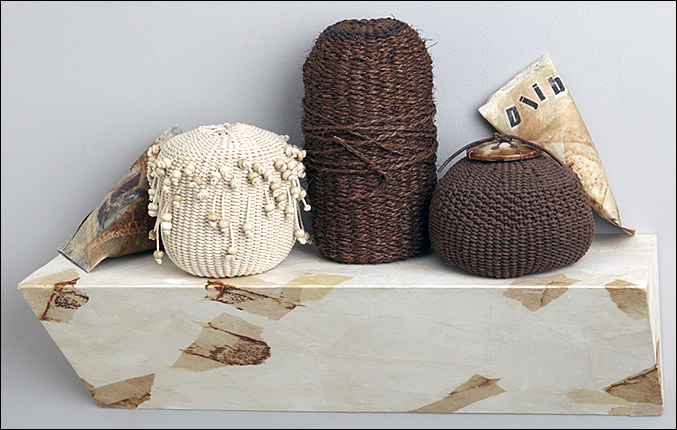 Over the years, I have woven a number of pieces that refer back to the Japanese tradition of wrapping stones with strips of bamboo and using the result to prevent erosion at the edge of bays, streams and other waterways. The image is so popular you can see it used extensively in Japanese prints, lacquer and other traditional crafts. I often use bamboo and dyed cane and fill the structure with twined "stones." You can go to my Links page and see the article. browngrotta is celebrating their 30th year of showcasing international textiles, mixed media and dimensional art. The celebration opened in April with their exhibition, "Still Crazy After All These Years." Do go to their website, browngrotta.com, to learn more and order the catalog. You can go to my Galleries page to learn about the two pieces I contributed and see images of them. The exhibition has already been written up in Venue magazine. I have included it on my Links page for you to see. This looks to be an exciting year! We are doing well in the beginning of this Year of the Monkey. I hope everyone has friends born under this sign. They are amiable, kind and generous with help. They may be a bit short of long range plans, but you will know that already. The year has gotten off to a great start for me. 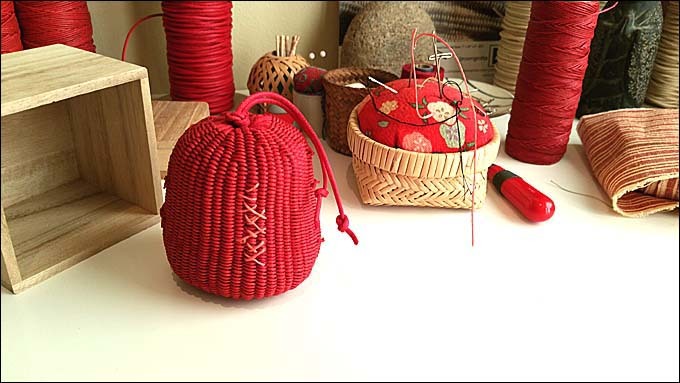 browngrotta arts has included my work in their exhibition, "Green from the Get Go: International Contemporary Basketmakers" at the Morris Museum in Morristown, New Jersey. This exhibition has an unusually long run from March 19th to June 26th. I hope some of you can attend. At least purchase the catalogue. Tom's detail photographs really enrich the presentation! 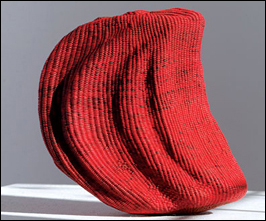 In the fall, browngrotta arts is presenting "Contemporary Art Influences by Korea and Japan: An Unexpected Approach" in collaboration with the Greenwich Arts Council and will be located in the Council's Bentheim. This exhibition runs from September 16th to November 4th. 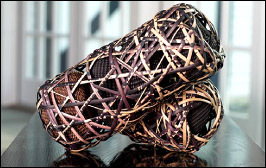 And looking forward -- Two curators/artists from the University of Missouri, Jo Stealey and Kristin Schwain, have been working with the National Basketry Organization on a basketry exhibition that will travel from June 1, 2016 to January 31, 2020. 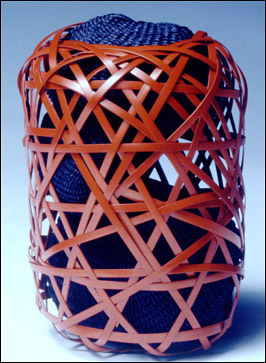 Titled "Rooted, Revived, Reinvented: Basketry in America", Schiffer Publications will publish the accompanying catalogue. 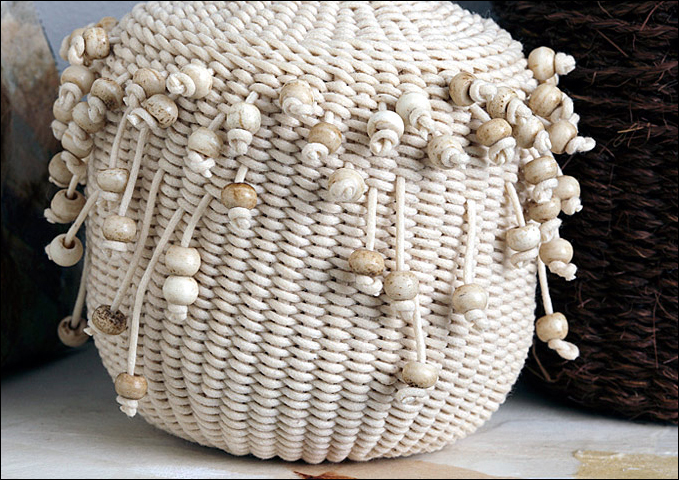 Pat Malarcher, former editor of Surface Design Journal, has included me in her essay covering basketry in the 1970's and 1980's. I had to reach back mentally to remember exactly what I was doing then. browngrotta arts is loaning my two piece set, Kaki Shibu, which is twined and plaited of waxed cotton, waxed linen, persimmon tannin, gessoed foam and dyed cane. I find travelling exhibitions especially exciting because they are often booked into smaller museums, including college campuses. I love knowing students might see my work and feel somehow connected to it. Somehow 2015 moved along exceptionally fast. I almost can't remember it. browngrotta arts gave me great support during the year. They included my work in "Of Two Minds: Artists Who Do More than One of a Kind." The catalogue, with an essay by Elisabeth R. Agro, is still available. browngrotta arts also placed two pieces of my work in a collector's new, Idaho home. I can't wait to see photographs of the installation. I hope Tom was invited to do the installation himself, as he has such an eye for placing art. 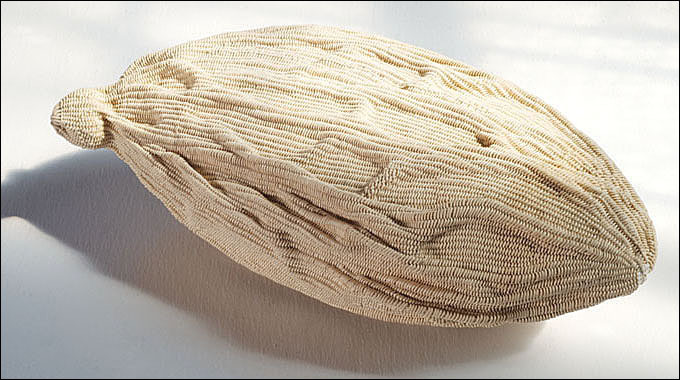 "Game Changers: fiber art masters and innovators." The Fuller, as we affectionately call it, is New England's home for contemporary craft. Located in Brockton, Massachusetts, its audience is all of New England and beyond. And I was fortunate that browngrotta arts was willing to loan the piece, "From Dialogue to Monologue," The Fuller requested. If you are reading this, it is already The Year of the Horse. Research suggests that, on the positive side, those born in Horse years...enjoy the limelight and are bright and energetic. Me. I'm a Sheep! Selecting carefully from a long line of possible characteristics, I should be a good care giver and very sensitive to art and beauty. I'll just ignore the part about being a worrier and over-sensitive. Regardless of your birth year, I wish you health, peace and beauty in your life. If you have been catching up on my other pages, you will know I am now back in Northern California, specifically, San Francisco. I have not yet returned to twining, but I will soon - the waxed cords will just call my name, and I will not be able to resist. Right now, I am inspired by the old boro textiles of Japan and the traditional pojagi wrapping cloths of Korea. Not unexpectedly, I began with my usual palette of black, red and cream, and I am incorporating both paper and fabric. But I am moving toward combining sheers with old textiles and top stitching in chartreuse. Who knows where this will lead, but I am smiling as I work and listening to shakuhachi music once again. Did you know that when I carved this form, I was thinking of a long eared rabbit bounding away? In Japan when children look at a full moon, they do not see the man in the moon. They see a rabbit pounding o-mochi (sweet rice). Rabbits are a popular design motif in Japanese printed textiles and paper goods. I especially love the images depicting playful scenes of rabbits holding bow and arrows or long grasses and chasing each other and other animals. thus distributing afar. If you think a half of a papaya is beautiful, you should see the full page image of one seed. I have already begun my next in the series. Late in May an art shipper picked up my new work, Djibouti Markets, commissioned by Art in Embassies for the new US Embassy in Djibouti. The curator expects the installation to be completed by the end of July. It was exciting to do the research for this project, though this is a relatively unknown part of the world, The Horn of Africa. The curator supplied me with camel bone beads, shell necklaces and pendants and local newspapers that I could incorporate into the work. Djibouti is known for its salt, and I added a small amount of French sea salt to the top of the shelf. The collaged shelf includes handmade papers, clippings from the local newspapers and paper from tea bags (this is a tea drinking country). Now on to the new work for the upcoming exhibition, Stimulus, at browngrotta arts in Wilton, Ct. this coming September. You will not be surprised to read that I am working on a small seed-inspired piece. It was quite exciting to be contacted by the State Departments Art in Embassies program. I had several commissions from their Foreign Buildings office (now under the umbrella of A in E) in the 1990s, but nothing since. Red Jars at Midnight is now residing at the US Embassy in Laos on loan for two years. As 2010 begins, I find myself very excited to continue with this higher density foam. Glacial Planes (top left) was my first successful sculpture using this new material. The edges and curves were more easily maintained and the textured areas are more significant as a result. I have been studying seed pods and feel inspired to start some groupings of smaller pieces that can be scattered together. I hope to have the first completed in time for SOFA/NY. Also, one of my work tables in the studio is covered with Japanese boxes and a large selection of small lids, some made by my ceramicist friend, Betsy Williams. I have been making doodles in my studio log, and I think I will be working on these pieces as well. I often like to work on varied projects that are on different scales and with different inspirations. With so much to do, perhaps Ill get through my boxed set of Philip Glass CDs. I have found the new series of carved forms so satisfying to twine over, that much of my studio time in 2009 will be devoted to continuing that series. I recently received a shipment of a higher density foam and had to cut it with a chain saw into more usable units! This foam holds a crisp edge more cleanly than the previous foam, and I hope to create a new sculptural grouping that takes advantage of this potential while still twining with waxed linen and cotton. Look for them at SOFA/New York SOFA/Chicago. 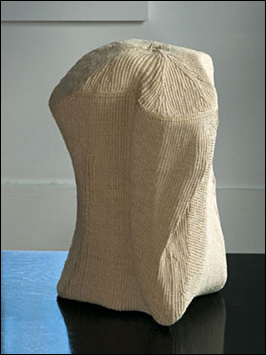 A few years ago, I took a big leap and started a new series of forms that were based not upon volume, but upon mass. Carving industrial foam and covering it with acrylic gesso offered me an entirely new approach for my twined sculptures. 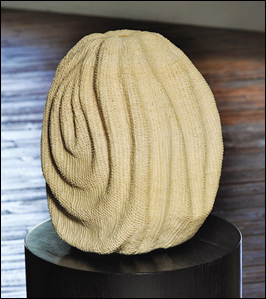 Many of us working in the area of "sculptural basketry" work in series, one piece inspiring the next. Some of my series were inspired by a great purchase of handmade papers in India. Some of my series were developed to support the theme of an invitational exhibition… Japanese influences, communication, censorship. However, some of my favorite work is the direct result of time in Japan. Both "Pebbles in a Stream" and "At Water's Edge" are my most recent, personal interpretation of the jakago/snake baskets seen in Asia. In Japan, miniature versions hold five tiny pebbles and are used to support chopsticks at the dinner table. The largest versions are constructed with wide bands of bamboo binding large stones at the edge of a river or lake to prevent soil erosion. I found the entire range of these constructions inspirational and a number of baskets have resulted. All work on this page is available through www.browngrotta.com.